Let me start out by thanking those of you who attended the installation service yesterday and then faithfully came back for even more church. I thank you, and God thanks you! Today is officially called the 25th Sunday after Pentecost. But it ought to be called the Sunday of the Two Widows. The first widow is a poor woman on the verge of starvation living in the Gentile region of Zarephath during the time of the great prophet Elijah. The second is a poor woman on the verge of starvation living in the vicinity of Jerusalem about 900 years later. Both are remembered. Neither are named. Then, we come to the story in today’s Gospel reading. As a child I always heard this called the story of the “Widow’s Mite.” I found this strange, since in modern English a “mite” is an insect. Well, it turns out that “mite” is also an obsolete word for a small coin. Who knew! The story of the Widow’s Mite is prefaced by a condemnation of the scribes. These were religious professionals trained in the art of reading and writing, as well as in the Jewish Law. Jesus condemns them for their pride and for their lack of mercy. They like to dress up and be noticed. They like to be perceived as particularly pious. But at the same time, they “devour widows’ houses.” What exactly Jesus means by the phrase “devour widows’ houses” isn’t clear. What is clear is that the actions of the scribes somehow leave the most vulnerable people in Jewish society without a roof over their heads. 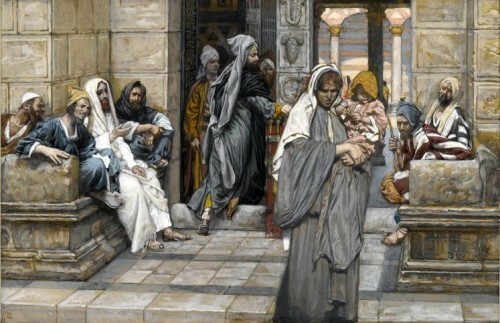 Then, we come to heart of today’s Gospel, the tale of that second widow who gives all her money to support the Jewish Temple. Now, in the English translation read today, it says that the two coins she put in the treasury were worth a penny. But in point of fact, her donation was worth about $1.88. It wasn’t much. But it was enough to buy some flour to make pita bread or to buy enough lentils for a bowl of soup. Instead, she gives it to support the Temple. Unlike the story of the widow of Zarephath, this widow’s story doesn’t have a “Hollywood ending.” We just don’t know what happens to this penniless widow. We can only trust that, as before, God will provide. This Gospel story presents us with a bit of a paradox. 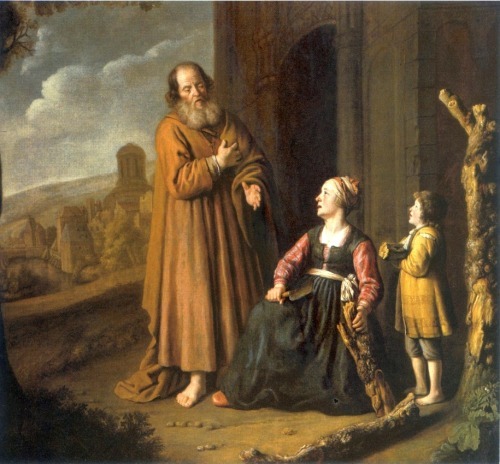 While the story of the Widow’s Mite commends the sacrificial giving of the faithful widow, the surrounding text condemns the same religious institution that accepted her sacrificial giving. Consequently, biblical scholars have interpreted the story in two very different ways. The first is that Jesus is praising the widow’s utter devotion and faith. The second is that he is lamenting the utter depravity of a Temple administration that would take a widow’s last two dollars. Frankly, it may be the case that both interpretations are true. Clearly, the widow’s absolute trust in God’s providence is to be commended. When she gave to God, she quite literally held nothing back. For the love of God, this widow gave her life to support the unworthy administrators of a doomed institution. In a real sense, the widows’ sacrifice foreshadowed Jesus’ own sacrifice on the Cross. For all too soon, he too would be called to give his life for the sake of the unworthy—namely, all of us! And that brings us to the here and now. I have no doubt that Jesus would commend the sacrificial giving of many of you, some of whom are widows. And if the truth be known, a few here give more than they should. Some, in terms of money; others, in terms of blood, toil, tears, and sweat. Your contributions do not go unnoticed. I thank you, and God thanks you. But I do not want this parish to fall into the same sin that the Jewish Temple did. So I say to you now: “Do not give your last two dollars to the church! Do not work so hard at church that all the joy of life is drained right out of you!” I tell you this, not because God does not appreciate your sacrifice (for he does! ), but because I don’t want this parish ever to put institutional survival above the well-being of its members. So, yes, please continue to give generously, even sacrificially. But know your limits, and feel free to hold back what you need to enjoy a full and healthy life. Trust me, the Lord will understand! © 2018 by Darren Miner. All Rights Reserved. Used by permission.